If you need a car that can increase your confidence in Wilkes-Barre, the Audi Q7 is a great option. This automobile has flair and is available at Audi Wyoming Valley. When you drive the Audi Q7, everyone will notice its profile. The side of the vehicle has a sleek, aerodynamic design that's very appealing. Under the front and back doors, you'll find sporty wheels that have the Audi logo. As these wheels roll, five spoke blades rotate as well; these thick spokes give the 21-inch wheels character. This Audi car has practical elements on the front and back frame as well. A bold grill with LED lights are found along the front of the Q7, and there is a convenient, sporty, hands-free tail gate near the trunk. 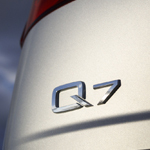 The Q7 also has many features in the cabin that stand out. If you want to cruise in a car that's modern, dependable, and luxurious, you'll benefit from buying the Audi Q7.